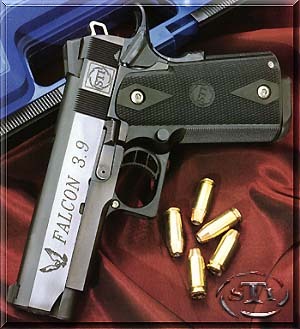 This is the STI Falcon .40 S&W 1911-style pistol which is no longer manufactured. The STI Falcon .40 S&W was designed for concealed carry, as it is a “chopped” version of the 1911 pistols and has a 3.9″ barrel. STI International, Inc. makes a wide range of 1911 pistols for competition and self defense. STI International, Inc. makes single stack and double stack 1911 pistols. STI Falcon .40 S&W pistols are nice but no longer made.